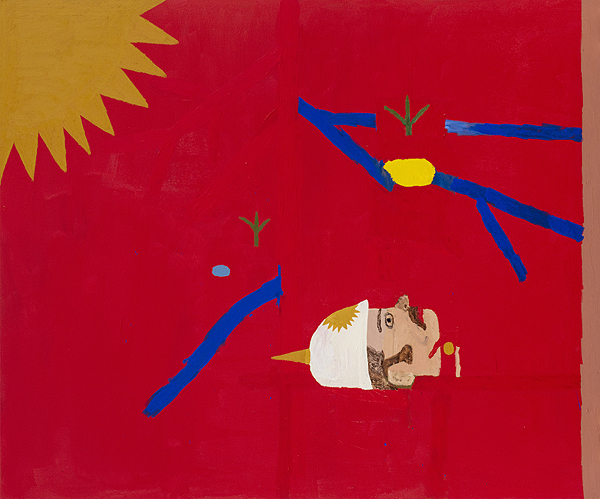 Zidoun-Bossuyt gallery is pleased to announce the first exhibition of British artist Danny Fox. The history of Skid Row in Downtown Los Angeles, where Danny Fox works and which informs Blood Spots on Apple Flesh, pivots on the stories of migrants. Formerly an agricultural center, the 54-block area was transformed by railroads in the 1870s, becoming a hub for recent arrivals with its brothels, bars, and seedy hotels. Throughout the twentieth century, the district welcomed those displaced by the currents of history. More than 10,000 homeless lived there during the Great Depression; in the 1960s, returning Vietnam veterans with addiction came to its treatment centers. Today, Skid Row has one of the country’s largest consistent homeless populations.2 Its character has been forged by newly arrived young men, often immigrants or travelers looking for a new start. Fox, a Cornwall native who arrived in Los Angeles in 2015 from England, on the chance meeting of painter Henry Taylor in a pub, fits squarely into this narrative. 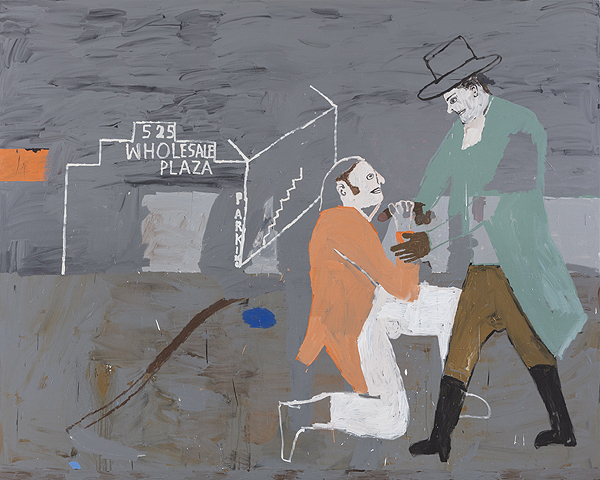 His paintings, which often train an eye on Skid Row’s inhabitants and rituals, entwine the brutality of contemporary life with idealized historical imagery. Like Taylor, Fox relies on a raw, unfiltered style of painting that draws attention to the act of making itself. 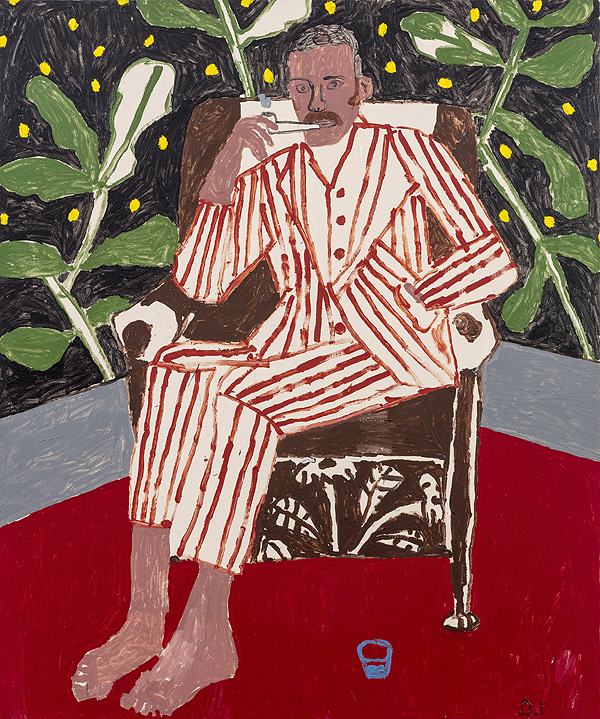 In various works in Blood Spots on Apple Flesh, Fox looks toward Victorian icons—namely, David Livingstone and the prodigal son lithographs of the Kellogg Brothers, celebrated nineteenth- century American lithographers—realized through flashes of his immediate surroundings. These famed stories of travelers are captured in the present, both metaphorically and figuratively, as Fox paints them through the raw, gritty portraiture that is his signature. Fox often asserts that his subject matter is arbitrary, realized more so by organic means of disseminating information—discovery, chance, environment—than by what he perceives as elitist preoccupations with content and its perceived value. “Painting isn’t about that for me,” he notes. In an age of algorithmic means of deciphering tastes, Fox remains committed to thematically painting on a human scale. He encounters his subject matter through walks, routines, and habits, keeping his images based on a kind of bartering system with the visual world, reflecting the primitive inflections of his works. Self-taught artist Danny Fox was born in St.Ives, Cornwall, UK, a seaside town made famous by its numerous artist residents. Despite moving from the town many years ago, Fox’s cornish lineage remains visible in his work. After setting his studio in Los-Angeles Fox recently moved back to the UK. 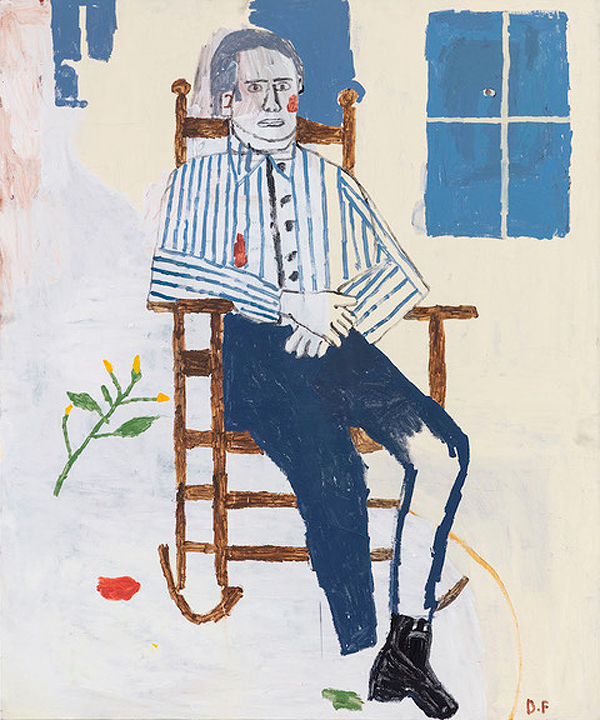 The exhibition gallery of Sotheby’s, Sotheby’s SI2 dedicated two solo exhibitions to Danny Fox in New York and Los Angeles (2016). Fox is part of Iconoclasts, a group exhibition at Saatchi Gallery in London (September 2017 – March 2018).